Today Georgie is THREE!!!! He seems so much older than 3 already though, he wants to be just like Jack and Tom, and tries (with considerable success) to do everything they do. 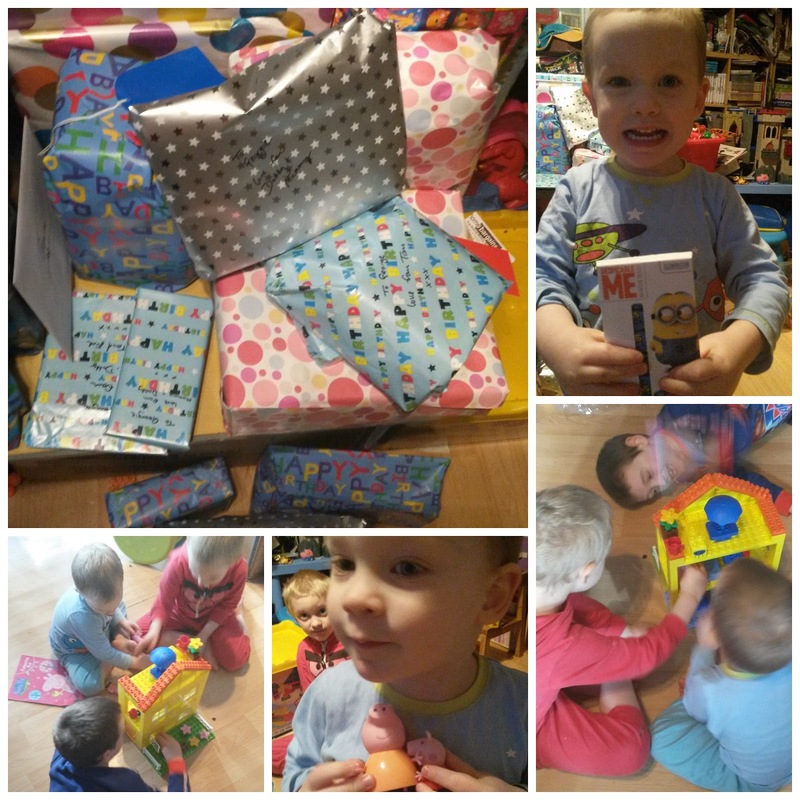 This years birthday is all about Peppa Pig! For weeks we have been asking George what he wants for his birthday and the answer has always been the same: "Peppa Pig Toys, more Peppa, dinosaurs, and a Peppa Cake!" So we've got him a ton of cuddly toys, some more plastic figures, and picked out a Lego style Peppa Pig building blocks house to buy with the birthday money my Dad sent over for him. And a bucket of dinosaurs! The sad thing is that for the last two days he has been sick. He was sick in the night on Thursday and he's still not 100% better yet. He really wants to go to Giggles soft play for his birthday treat but I can't take him if he's been sick (schools etc have the 48 hour vomit rule for a reason) so we're going to go tomorrow instead. That will be better really though, because all he's wanted to do today is play with his new bricks and new play doh. Plus Daddy has been working today so a family day out tomorrow and a play day at home today seems like a much better deal all round.